At times when the social media plays a key part in almost everything in the world from sharing a photo with friends and to bring down totalitarian regimes, the importance of varied social networking functionality is vital and in some cases can be the difference between life and death. And if you think I’m overly melodramatic, think about the following very realistic scenario: A Syrian rebel capture in a video how the Syrian military is shooting at protesters, to show it to the world. The Syrian government is using this video to identify the people in the protest to hunt them and their families down. …Suddenly not too melodramatic at all, right? It appears that the folks at YouTube also grasp how crucial their role is and they are now releasing a new tool which will allow enhanced protection capabilities for sensitive footage- On the official video site’s blog, YouTube’s Amanda Conway announced on the Face Blurring tool. YouTube has developed some sort of face detection technology and although it isn’t as accurate as the recently acquired Face.com by Facebook, it still manages to capture faces at a satisfying level. But even YouTube states that due to environmental conditions sometimes the tool won’t work perfectly. Another somewhat problematic issue with the tool (at least for the time being, may change in the future) is that there isn’t any option for selectively blurring certain faces. 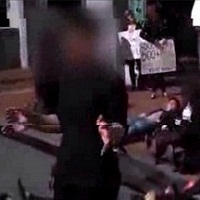 Once activating the tool, it automatically blurs all faces it identifies on the video. 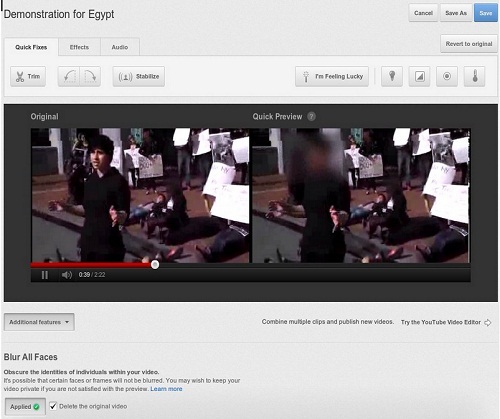 But yet, even with all its current flaws, YouTube’s Face Blurring tool is a great step forward. Ironically enough, even though the tool’s action is to censor, it can result a much greater uncensored world where people won’t be afraid to go on the record. After you upload the video, enter the Video Manager. Click on the Edit button next to the video you wish to blur faces. Select Enhancements and click on Additional Features. At the bottom, click on the Apply button for the Blur All Faces (you can select if to delete the original video). Then you’ll see a preview of the new video next to the original and if you’re satisfied with the result, save it.